Interested in bringing your class to Tiny Towne? Click Below to view our field trip package options and inquire on availability! Plan your next field trip at Tiny Towne! Tiny Towne is designed with schools in mind. Students will be able to spend a fun day at Tiny Towne, during which they will learn about traffic rules, road signs and road safety in our instructional classrooms and using the other specially-designed educational resources on-premises. 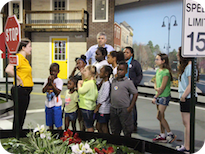 When organizing a field trip to Tiny Towne, classes should be a minimum of 15 students but should not exceed 30 students per class. 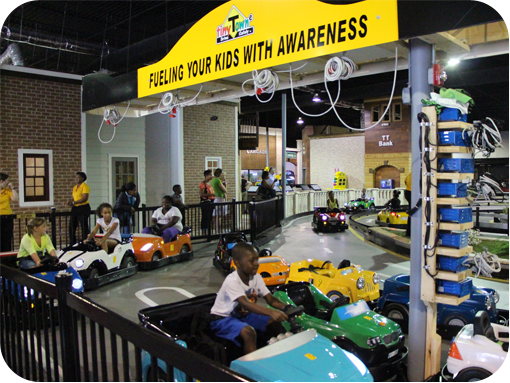 We offer four educational stations relating to awareness of traffic rules, road signs, and safe driving tips. The four stations require students to observe, discuss, experiment with, and practice the material presented. The content of the lessons will depend on the age group of the students. 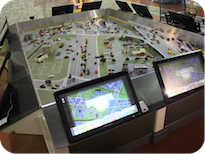 At this station, groups of all ages will participate in a collaborative discussion at the Interactive Model, where they will learn about road design, road markings, and where road signs are placed. 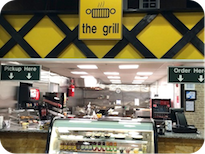 Then, using specially designed interactive software, students will be prompted to install a number of missing traffic signs based on what they just learned. 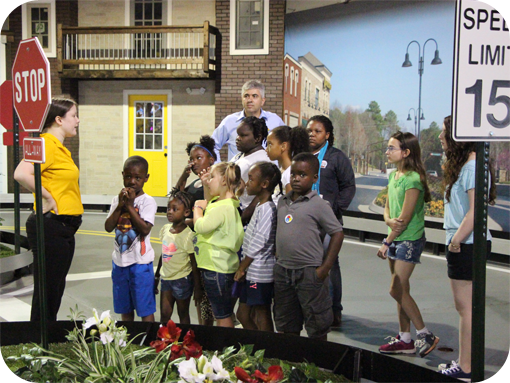 The second station at Tiny Towne consists of a lesson where students discuss traffic rules, driving-related history, and road signs and markings in more depth. 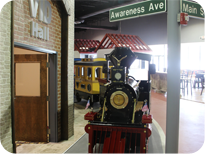 Our trained instructors provide a presentation and video for the students in our VID Hall or a walk around the town to experience the lessons first-hand. 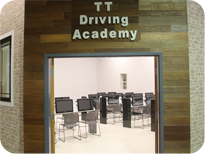 Students go to the computer lab for the third station, where they consider different driving rules and scenarios with the instructor and complete a touch-screen assessment. The computer lab accommodates 30 students, and the instructor can see each student’s answers in real time and facilitate further discussion or explanation if needed. The fourth station allows students to put their driving skills and knowledge of traffic rules to practice. 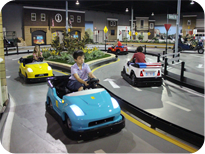 Depending on the age of the students and the class size, students might use the driving simulators or they might get to practice driving on the Tiny Track (8 drivers per 5 minute round) or Traffic Track (only open to Tiny Towne Permit holders). 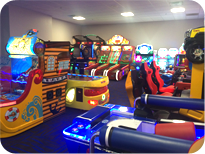 The children can enjoy some time in the Carcade, equipped with about 30 games including sports games, video games, and redemption games, and players can play individually and aim for a personal best or challenge a friend. Field Trip Pricing is fully customizable, depending on your program selection! Prices start as low as $10 per child! To meet the budget allotted by your individual school, the selection of activities from the list above included within each field trip is decided by the individual school – not by Tiny Towne. Call us at 470-265-6665 to schedule an unforgettable educational field trip experience at Tiny Towne!